Gulf states with deep pockets and big appetites are asserting themselves in the Horn of Africa as never before. The flurry of new economic and military investments is reshaping geopolitical dynamics on both sides of the Red Sea, as two formerly distinct regions are fast becoming one. The emergence of a common political and economic arena—astride one of the world's most valuable trade routes—offers opportunities for development and integration. But it also poses considerable risks. For the fragile African states on the western shores of the Red Sea, new engagement from outside powers has proved both tonic and toxin. As the United Arab Emirates (UAE), Saudi Arabia, Qatar, and Turkey seek to expand their influence in the Horn of Africa, they are exporting Middle Eastern rivalries to a region that has plenty of its own. And they aren't the only outside powers now paying attention to this once sleepy neighborhood. China recently established its first-ever overseas military installation in Djibouti—just six miles from the only U.S. base in Africa—making the Red Sea an emerging theater for great-power competition. At its center is the Bab el Mandeb strait, a narrow shipping corridor through which hundreds of billions of dollars in oil and other exports pass between Europe, Asia, and the Gulf. Immediately across the strait are the shores of Yemen , where one of the world's most devastating wars—and most fervent proxy battles—continues to rage. Historic changes are meanwhile under way across the Horn: Ethiopia is experiencing double-digit economic growth and undergoing its most sweeping political transition since the early 1990s. Eritrea, long ostracized for its human rights record, has been relieved of a decades-old UN sanctions regime. And the two longtime adversaries surprised citizens and observers alike last year by initiating a rapprochement. Somalia's federal government, buoyed by new regional cooperation, may finally be turning a corner after decades of insecurity. Whether external engagement will help or hinder long-term change in the Horn depends on how well African states can manage asymmetric relationships with Gulf partners. These weaker states—already strained by domestic volatility—must find a way to harness investment without surrendering their sovereignty or being drawn into political rivalries that offer little reward. Since 2015, cash-rich Gulf states have made a mad dash for real estate on the Red Sea coast. 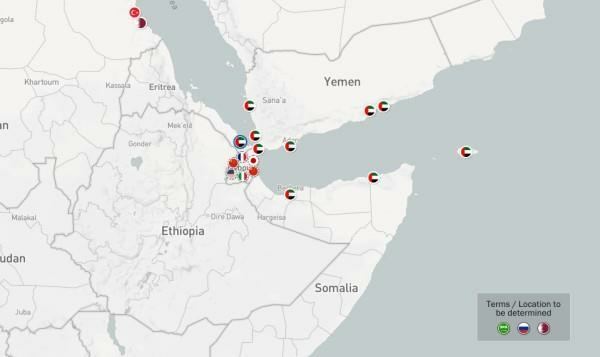 New seaports and military outposts have proliferated as these states snap up strategic perches in Djibouti, Eritrea, Somalia, Sudan, and even Yemen. The Gulf states have aggressively pursued these outposts as part of their larger efforts to redefine the regional order and assert themselves as players on a global stage. The following interactive map displays the acquisition of seaports and establishment of new military installations along the Red Sea coast. So far, Gulf and Turkish engagement has transiently benefited some African states and fueled polarization in others. An injection of Emirati cash into Ethiopia, for example, has temporarily shored up that country's dangerous debt crisis, extending the honeymoon period for its new prime minister, Abiy Ahmed. The 42-year-old leader, Africa's youngest, has outfoxed the country's old guard and is fast dismantling the security state they fashioned—by ending a state of emergency, releasing thousands of political prisoners, and easing restrictions on media and free expression, among other reforms. Abiy also plans to privatize major industries and has appointed record numbers of women to senior posts, winning hearts and minds at home and abroad. But the electric fervor known as 'Abiy-mania' will be tempered as Abiy's extraordinary change agenda meets obstacles, including the unrest now bubbling across many of Ethiopia's ethnic regions. Stability in the nation of 100 million depends on Abiy's ability to advance this ambitious reform program while responding to popular demands, quelling skepticism, and overcoming a widespread sense of uncertainty. Gulf states would thus be wise to temper their appetites, exercise patience, and refrain from introducing Gulf divisions into an already precarious environment. For his part, Abiy wisely declined to choose sides in the 2017 Gulf crisis. And while Abiy has accepted Emirati support and partnership (including an additional $2 billion in pledged investments), he has trodden carefully in public, conscious that being seen as a client of Abu Dhabi or Riyadh would undermine him at home. In neighboring Eritrea, President Isaias Afwerki has benefited more clearly from Gulf engagement—at least in the short term. New investments from Saudi Arabia and the UAE have helped bring his long-isolated regime in from the cold. When the Saudi-UAE coalition joined Yemen's war in 2015, it needed a Red Sea outpost from which to launch air and sea campaigns and chose Eritrea's port city of Assab, transforming it into a substantial military base. After a dramatic falling-out with Djibouti over the operation of its main port, Abu Dhabi is also keen to redevelop Assab's defunct commercial port and make it the primary lifeline for the region's economic heavyweight, Ethiopia. The new Saudi-UAE relationship with Eritrea also helped lift the UN sanctions regime against Eritrea and grease the initial rapprochement between Asmara and Addis Ababa. The monarchies then invited Afwerki and Abiy to celebrate the historic détente by convening palatial ceremonies in Jeddah and Abu Dhabi. But normalization between the two African countries has only just begun. Although there is cause for optimism, Gulf leaders should pay close attention to the domestic political calculations motivating rapprochement and the risks of moving too fast. A host of thorny issues remains to be negotiated, while old political adversaries and armed proxy agents will not acclimate easily to new realities. Gulf leaders should also beware of investing so heavily in individuals rather than in institutions: Afwerki has long been the most unpredictable figure in the region, and he now confronts increasingly unpredictable politics at home. Without an external enemy in Ethiopia to combat, his decades-old authoritarian grip on Eritrea may finally be loosening. While Gulf engagement in Ethiopia and Eritrea has produced ambivalent results, Somalia's experience clearly demonstrates how divisive it can be. Saudi Arabia, Turkey, Qatar, and the UAE have all inserted themselves in Mogadishu's political arena in recent years, hoping to win allies, investments, and influence over Africa's longest coastline. And heavy-handed interventions, illicit payoffs, and Gulf mudslinging have magnified divisions in an already fractious country. Turkey's presence in Somalia predates that of the other regional actors, and many Somalis have welcomed it. Ankara began sending humanitarian aid to Somalia during the famine of 2011 and has invested substantially in the country ever since. The Gulf states and Egypt fear that Turkey has deepened its engagement with Somalia and Sudan in an effort to project Turkish influence across the territory of the former Ottoman Empire. The UAE had likewise invested in an alliance with Mogadishu. But in 2018, Somali President Mohamed Abdullahi Mohamed ('Farmajo') seized a planeload of Emirati cash on the tarmac in Mogadishu, accused the UAE of meddling, and declined to choose sides in the Gulf spat. Concerned that Farmajo was in league with Qatar and Turkey, Abu Dhabi turned on the president, ramping up support for his adversaries in Somalia's federal states and doubling down on deals with local officials in the autonomous regions of Somaliland and Puntland for another military base and two new ports. Mogadishu protested furiously, while the benefiting states declared their support for the Arab quartet, thus aggravating tensions between the country's center and its peripheries. New competition among great powers has further complicated the chess match in the Red Sea. China's military base in Djibouti brings the number of foreign militaries in the tiny city-state to five. China, France, Italy, Japan, and the United States are all now stationed at the fulcrum of the Red Sea. India and Saudi Arabia have also signaled interest in establishing bases in Djibouti, long home to the only deep-water port in the region, while Russia has initiated talks with Eritrea about its own strategic presence on the Red Sea. China's expanding interests in Djibouti, together with its new naval facility, have prompted anxiety both on Capitol Hill and at the White House—where a Trump administration increasingly focused on great-power rivalry is now reconsidering its military posture in Africa. The fact that Washington is paying greater attention to this region is a good thing. But while strategic considerations are critical, U.S. policy in the Horn of Africa and the wider Red Sea should not be dictated entirely by rivalry with Beijing. With proper management on both sides of the Red Sea, Gulf and African countries can benefit from new engagement. African states, in particular, can use the investment and assistance to develop infrastructure, create jobs, and access global markets as they attempt to modernize their economies. Some regional diplomats have even called for a Red Sea forum—a collective that would work to secure the region's waterways, regulate migration, achieve food security, fight extremism, and manage conflict and displacement. This best-case scenario for the Red Sea is unlikely to be realized, however, until several processes mature. States in the Horn of Africa need to advance domestic reforms and regional integration such that they can articulate shared interests and negotiate with Gulf partners on a more equal footing. Middle Eastern rivals—none of them strong enough to achieve dominance—need to finally resolve the Gulf Arab crisis, or at least de-escalate. And the United States and China need to avoid clashing over current tensions and achieve some kind of equilibrium in the region. None of these eventualities is assured. Without progress on each front, the increasingly militarized and crowded Red Sea region will remain a dangerous battleground.